Indra took Yudhisthira to heaven in his chariot. As soon as he stepped into heaven, he was surprised to see Duryodhana there and he asked Indra how a person like him could be in heaven Yudhisthira couldn't see Draupadi and his brothers anywhere and he questioned Indra about them. Indra called a guard and asked him to take Yudhisthira to his brothers and Draupadi. The guard took Yudhisthira through a foul-smelling path strewn with the bodies of dead animals. Yudhisthira was finding it very difficult to follow the guard but did not say a word. Suddenly, he heard some cries and familiar sounds. He heard a voice saying , " I am Bhima" and another one said, "I am Abhimanyu." Yudhisthira realised that his brothers and wife were in hell. Furious to see his loved one suffering he said, "I have no right to live in heaven while my loved ones are suffering here." Suddenly, Dharmaraja appeared and the foul smell changed to a sweet fragrance. He blessed Yudhisthira and said that he had put Yudhisthira through a test by showing him that his brothers and Draupadi were suffering in hell. 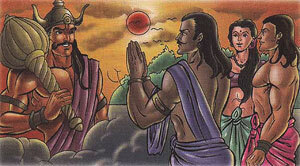 Since Yudhisthira had decided to stay with them in hell., Dharmaraja had come to bless Yudhisthira in person. He continued, saying, "None of your loved ones are in hell. This is just an illusion to test you. You have always been an ideal king and it is essential for you to see the suffering people go through in hell." Yudhisthira was delighted to hear that his brothers and Draupadi were in heaven and he joined them there.